is an organism of historical and symbolic studies specialized in the planning of exhibitions, cultural shows and events. The Association “Le Tarot” created important exhibition events including the most important international exhibitions about the Tarots, for which it has obtained the Patronage of the Italian Ministry for the Cultural and Environmental Heritage (Protocol n. 16638 dated January 1995). The Association “Le Tarot” can boast the co-operation of important museums and libraries, like the Metropolitan Museum of Fine Arts in New York, the National Gallery in Washington, the Victoria and Albert Museum and the Warburg Institute in London, the Graphische Sammlung Albertina in Vienna, the National Bibliothèque in Paris, the Bayerische Staatsbibliothek in Munich, the Gallery of the Uffizi in Florence, the Egiptian Museum in Turin, the International Museum of the Ceramics in Faenza, the Archaeological Civic Museum in Bologna, the Marciana Library in Venice, the Library of the Archiginnasio in Bologna, the Communal Library in Mantova, etc. The Association “Le Tarot” conducted its researches for more than thirty years and has collected to date a wide range of artistic and historical works about Tarot and other matters. Now its Collections, structured in form of exhibitions, are available to whoever requires them. Each of them is provided with indications about general structure, different exhibition sections with some photographs and any other useful information. Andrea Vitali was born on the 2nd of March 1952 in Faenza (Ravenna - Italy). He graduated in Humanistic Studies at the University of Bologna, and subsequently earned a post-graduate degree in musicology. He also completed a series of courses at the Scuola di Archivistica, Paleografia e Diplomatica [School of Archival Studies, Paleography and Document Authentication] at the State Archives of Bologna. After many years of teaching and directing the public library of Brisighella (Ravenna), he devoted himself to the study of Medieval and Renaissance symbolism and iconology with particular attention to religious and secular festivals and the structure of triumphal processions. 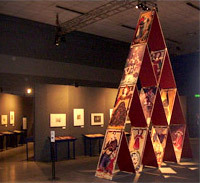 This exhibition, not has been projected to let people know the history of tarots through a presentation of numerous card decks, but has also been conceived introducing their production in the amplest context of religious, philosophical, anthropological and artistic history of the various centuries in which they are born, developed first in Europe and then in the whole world. The exhibition has the patronage of the Ministry for the Cultural and Environmental Heritage.